There is no reason for them to admit anything. This goes back to very same thing I communicated several times since the beginning: there are just not enough people complaining about this for it to become a bigger issue than what it really is for anyone affected. Fact of the matter is that this bothers just a few people that contribute to this thread and then perhaps a handful of more that we don't know of. This doesn't compare one bit to the media noise the K1 screengate made that ultimately forced BlackBerry Mobile to issue a statement. If any of you use in-line Reply from the notifications shade you will notice that the cursor mode bug doesn't rear its head while typing your reply. However, I still can't reproduce! I think I'm lucky!!! But i'm facing other issue where virtual keyboard gets popped up occasionally. Any clue about this? I could happily live without cursor mode it's useless especially with the sensitivity when you double tap but not depress the key.. And the lack thereof when you swipe too fast. That's the only time I miss my Priv. The latest email from Irai @ Blackberry Mobile Care. The best acknowledgment I have read so far! Wow, I will take it for some kind of admission. Promising stuff. Plus, our own analysis concluding that typing style has a lot to do with it is pretty much on the money! Perhaps you can reply to him with the Reddit link and ask if that update is the supposed cure all? Crusader03, Bob80220 and TheBond like this. It's pretty much what we have stated, even the choice of words. Looks like they have followed our threads pretty closely. Hopefully we'll see the update soon. I'm getting pretty tired of this now. According to that Reddit link a possible fix is coming in February or March. It looks like way more than just a fix. It seems to be a whole redesign of the keyboard software, away from what we have installed now. So the rumors go anyway. In any event, it will be interesting to see what TCL/BBMo releases in a couple of months. Jake2826 and Crusader03 like this. Willing to pay more for a variant with no camera! Since I'm not experiencing any spacebar key issues, and the camera is adequate for my needs, I'm hoping for an update that gets the PKB issues resolved. According to that Reddit link, if factual, that is what is in the pipeline. Crusader03 and RK_BB like this. 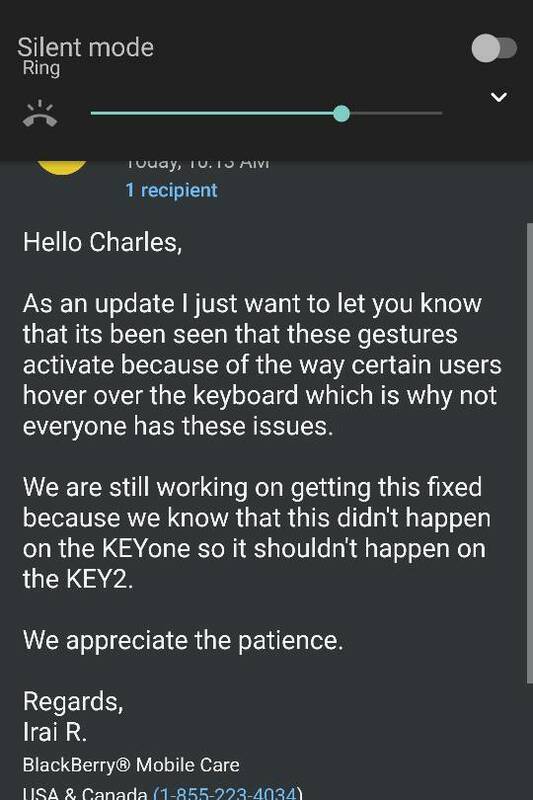 This is reassuring, if not a little frustrating that the fix might arrive six months after I purchased my Key2. I have large thumbs, so it's almost impossible for me to hold my Key2 and not touch the Sym, Shift or Alt keys while typing. Thank you so much! I would never have thought to look under languages! It reaffirm the Reddit thread. How does it reaffirm it? I don't read anything in that thread that implies that. LiamQ also noted here that this particular word substitution keyboard module was written quite a wrong way, and it has to be made from scratch again. Funny how LQ never indicated that there will be rewrite from scratch about this issue. While this issue has nothing to do with ours, the discussion does indicate the dev admitting that this specific software module has to be rewritten. My personal reading of this affirm the Reddit thread. We take our hope wherever we can get it. Oops! I didn't mean I got any hope from that. I've never been the one to see Unicorns in clouds.